Welcome to all you Colorful Folks!!! My Colorvision can Improve the Quality of your life one Color at a Time! 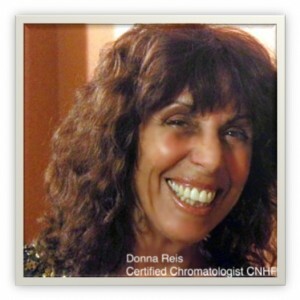 Let’s talk about the Importance of Color, Light and Essential Oil Therapy…………………I’m Donna Reis and I would like to share with you my knowledge regarding Color, light and essential oil, therapy. I have studied Color and light therapy for over thirty years. I am a licensed Color Therapist and Certified Natural Health Professional. I’m excited to share how Color, light and essential oil therapy can assist you in creating a healthy lifestyle free of emotional baggage. By releasing and healing our emotional issues we can prevent dis-ease from entering our physical bodies, the proper utilization of Color Therapy can assist you in achieving this balance. Our Color Vibration® Color Balancing System can support you in making positive changes in your life. Understanding the power of Color Therapy and its vibration will bring balance and clarity to your life. The proper use of Color can improve your mental, emotional, physical and spiritual health, along with assisting you in defining your life’s purpose.Interest in Color therapy dates back to the ancients in Egypt and India; many temples in Egypt were devoted to the chakras (energy centers) of the body. The Ayurvedic texts of ancient India recount the Gods using colored light to heal the body and to inject life force into food and water. This makes the principles of Color Healing, Auric Healing and Auric Reading as old as all of recorded history. The return to the simple principles of Color Healing is important to us today, as health care costs skyrocket. Remember Color healing is inexpensive and easy for the individual to use and master. Thank you for visiting mycolorvision.com I hope you enjoyed your time here. Color has had a profound effect on my life, I have been teaching the power of color to assist folks in moving there life forward for over 25 years. I have travelled throughout the world as an educator in the field of vibrational wellness. Now I would like to invite you to visit www.alinktospirit.com I am very pleased to offer this site to you. My Color Vibration® Color Therapy work has been accepted and is utilized throughout the world with that said, I felt it was time to offer my knowledge and services as a physical medium. I have been seeing clients as a physical medium for many years however this has been from word of mouth. I have now decided to step out and let folks know the power of working with spirit. With the veil thinning more and more folks are now connecting with their loved ones after they have passed on. Folks are seeking answers and I feel it is time as a spiritual life coach to offer my knowledge and services as a medium.